Steve Johns and Patricia O’Connor make their way from canoes to the signing ceremony. Members of the Mill Creek Watershed Council of Communities and Groundwork Cincinnati-Mill Creek shared the belief that a merger will let them have the greatest impact. 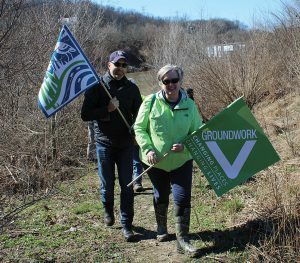 “Our combined organization will be able to speak as a single, strong, vibrant voice, giving us greater ability to improve the Mill Creek and build it as a community asset,” said Patricia O’Connor, chair of Groundwork Cincinnati. 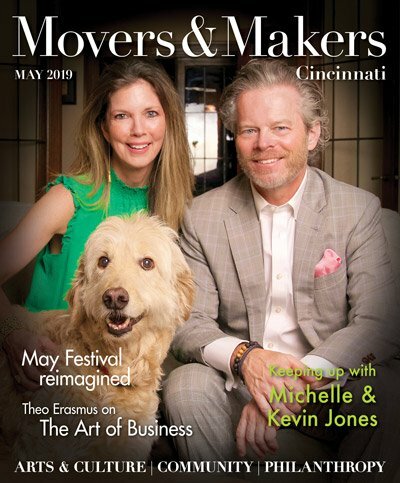 A merger makes sense operationally because of the complementary strengths of the two organizations, the leaders of the two nonprofits said. All staff members and programs will be retained because there is no major overlap between the two organizations. 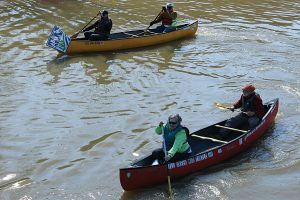 Leaders of the two groups arrive by canoe for the merger signing: Steve Johns (front, yellow canoe) and Patricia O’Connor (front, red canoe). The merger comes at a time when conditions in the creek and its watershed are the best they’ve been in decades. Fish and wildlife have returned, flood control has improved and water quality is better. People canoe and fish in the stream again. Additionally, the creek has been removed from a list of the nation’s most endangered rivers, placed there in 1997 by American Rivers, the nation’s leading river conservation organization. The two organizations staged a signing ceremony March 2 on the stream banks in Salway Park. O’Connor and Johns arrived in canoes to sign the merger documents.